I have been walking a shamanic path for over 12 years. I initially got into shamanism to support a friend who was on her path of healing and can you guess what happened? It became my path of healing and of heart! Sometimes our spirit has to trick us to open a door we might not so easily open and I am profoundly grateful that my spirit got me through that door and into shamanism! After experiencing much personal healing and walking my path with heart for 8 years, I realized that part of my gift is to share this with others who are seeking balance and healing in their life. Since then I have completed both a Shamanic Coaching and a Shamanic Practitioner program which has trained and supported me to work with individuals and groups. 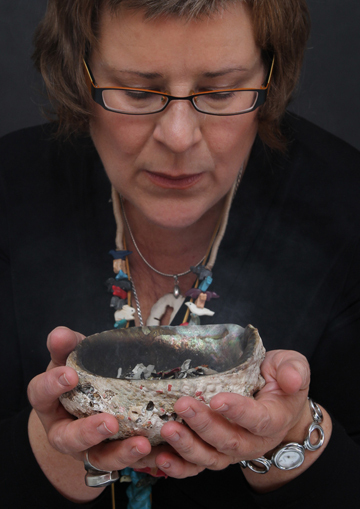 As a Shamanic Coach and Practitioner, it is my role to support, clarify and share resources so that you can do what your spirit is guiding you to do. I work with your intent and if you can’t articulate one, I can help you with that too. I bring together all of the knowledges and techniques that I have been taught and I add to that my life experience as a seeker of truth. I have always been a seeker – a seeker of the secret of powerful transformations, a seeker of the ways of healing. I am a lapsed academic (I loved epistemology – the study of how we know what we know, aesthetics – the study of beauty, and the deconstruction of the subject/object relation – a modernist philosophical issue), a partner in a long-term committed relationship, a mother of a 20 year-old daughter, a daughter to parents who recently celebrated their 55 year anniversary, an older sister, and a friend. I have studied hard. I’ve pushed myself to the edge. I’ve stuck it out till things shifted and got better, I’ve waited and I’ve learned to see the truth of spirit within life and learned to trust my spirit and the flow of life. I hope that in some small way I can support your spirit to become more present so that you too can soar! Anything else you might want to know about me? Or, is there some part of your own journey you want to share?